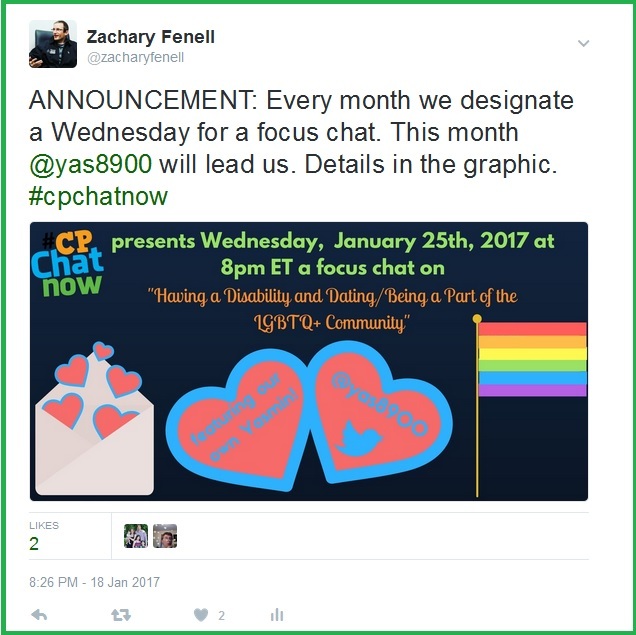 This week’s #CPChatNow focus chat focused on “Having a Disability and Dating/Being a Part of the LGBTQ+ Community”! 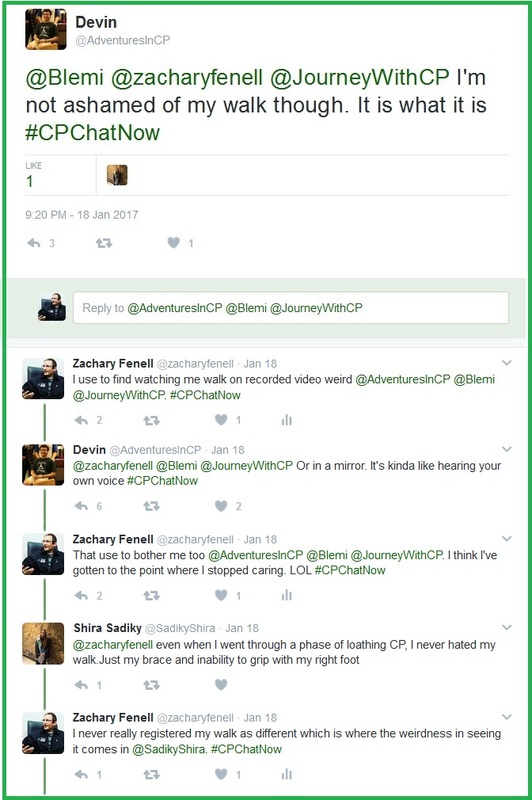 I am #CPChatNow interim co-host Devin Axtman, and I will be the conductor on this week’s recap of our Twitter chat. 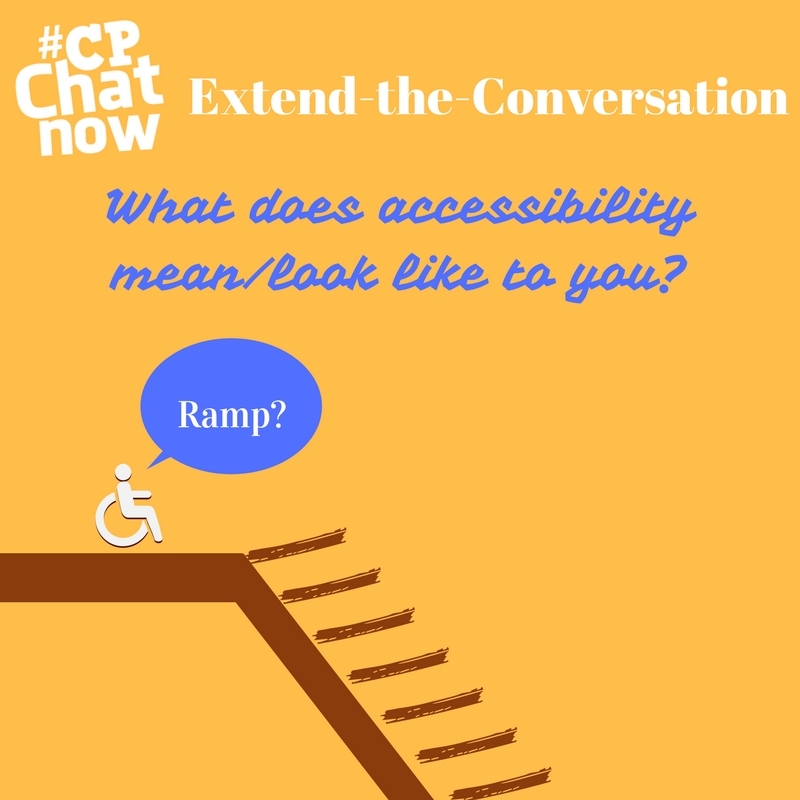 #CPChatNow community member, Yasmin, led the chat from the UK! We thank Yasmin for her efforts and for openly sharing her experiences. Yasmin sparked the chat’s dialogue by disclosing that she identifies as asexual and how she learned about the term. Yasmin also disclosed that she identifies as Aromanitc. Yasmin reported her identity was a gradual process that took awhile to sink in. Yasmin really sparked the conversation with common misconceptions around those who identify as asexual. #CPChatNow member Jen talked about how she feels misconceptions of the disability community and dating start. 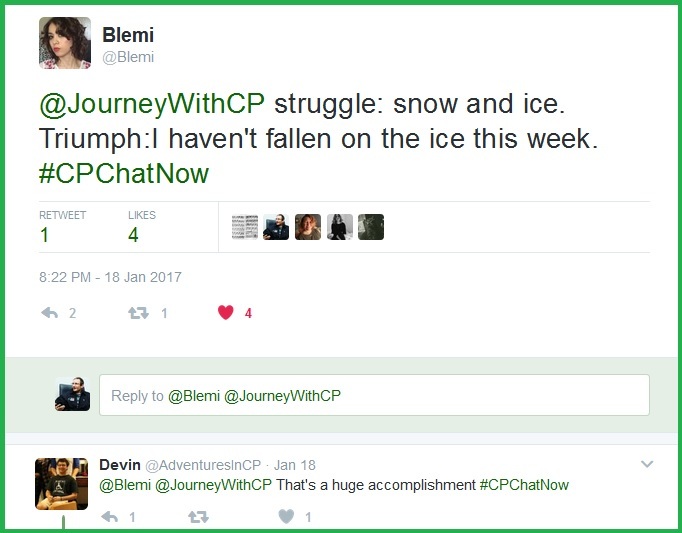 Finally, #CPChatNow members Alena and Erin talked about their climbing and skiing skills! What are some misconceptions surrounding the disability community and dating? Please share in the comments! 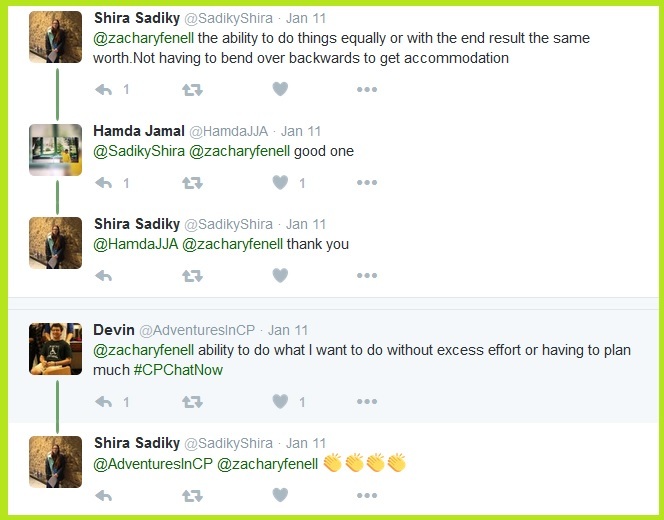 Cerebral palsy’s presence during daily activities proved a common theme throughout our live Twitter chat Wednesday, January 18th, 2017. 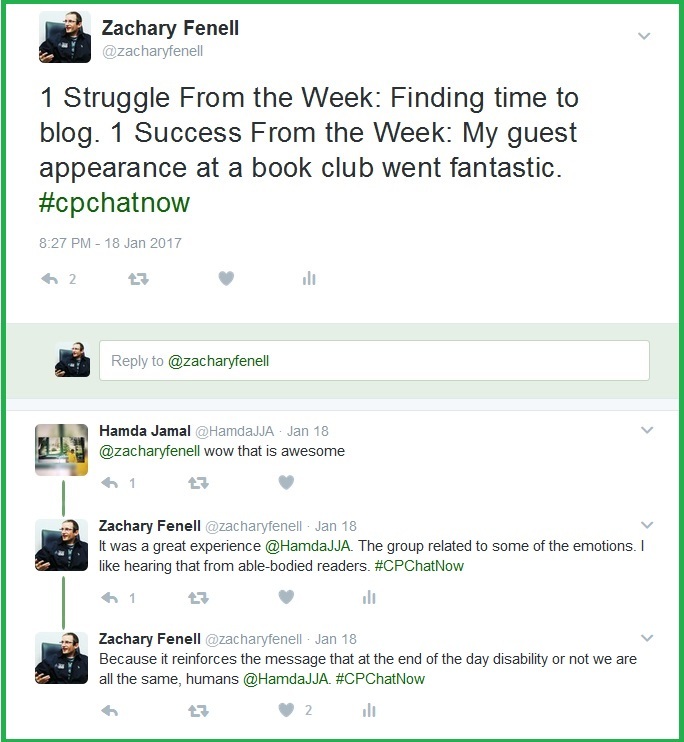 I am #CPChatNow co-host Zachary Fenell and you know why I am here. To recap our latest Twitter chat! 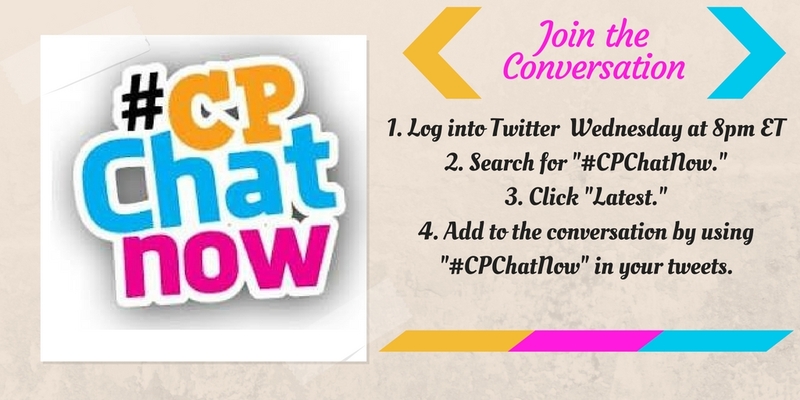 Every week #CPChatNow seems to gain new or renewed interest. Amanda, a familiar face to our long-term community members, returned and sparked much dialogue. First, she asked everyone to share a highlight and struggle from the past week. 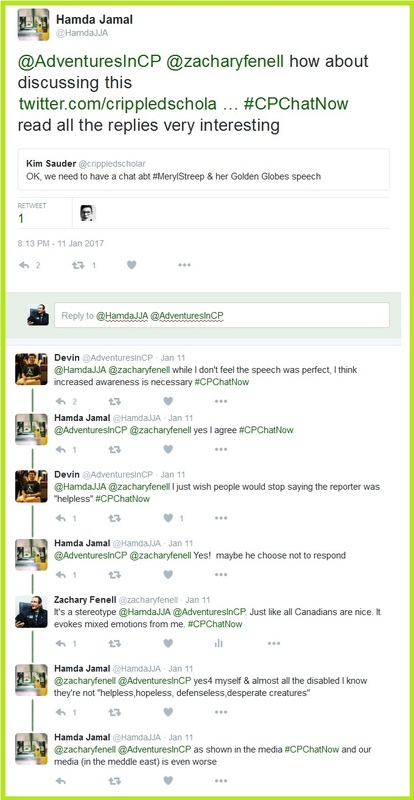 Some people’s struggles demonstrated the previously mentioned theme, CP’s presence during daily activities. Blemi for example called attention to the difficulties winter brings. 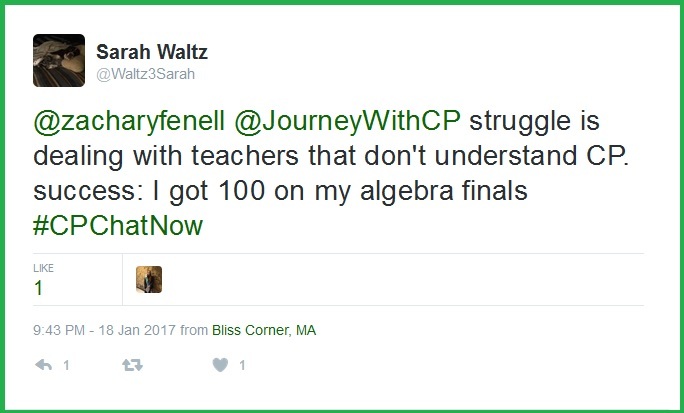 Meanwhile Sarah Waltz‘s struggle dealt with CP on an emotional level. Specifically, she sought empathy. Other answers remained lighthearted and provided a laugh or two. My interim co-host Devin Axtman supplied such. 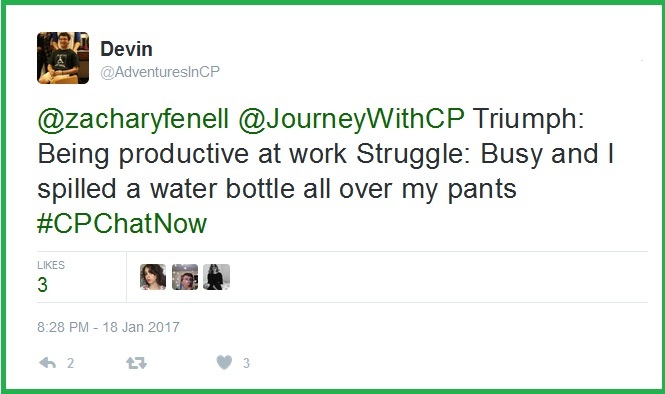 Certain answers transcended the cerebral palsy community. My own struggle I am sure many could relate. Time management stands an issue for able-bodied and disabled alike. A couple individuals shared weight loss as their weekly triumphs. That led relative newcomer Jen Coventry to seek out exercise advice. If you want to read the article I recommended, awesome! Checkout “Exercises To Try At Home For People With Disabilities.” Hopefully you also find the post helpful. As the chat continued physical activity stayed a hot topic. Amanda asked opinions on requests she received to film her walk. Said dialogue turned to seeing yourself walk. Like someone walking, let us keep this conversation moving forward. 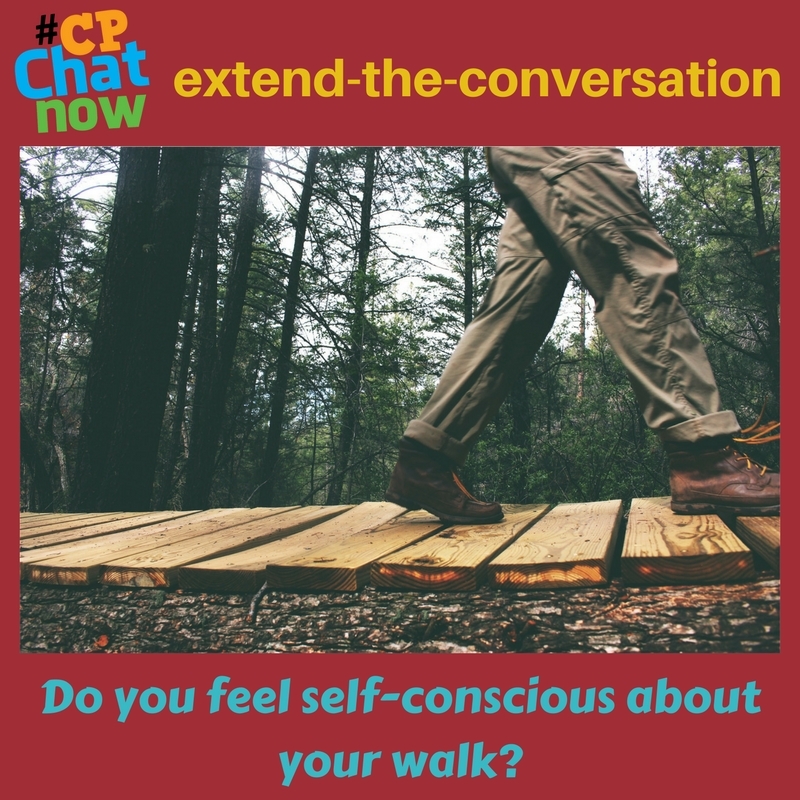 Answer for the week’s extend-the-conversation question “Do you feel self-conscious about your walk?” Leave your response in the “Comments” section. 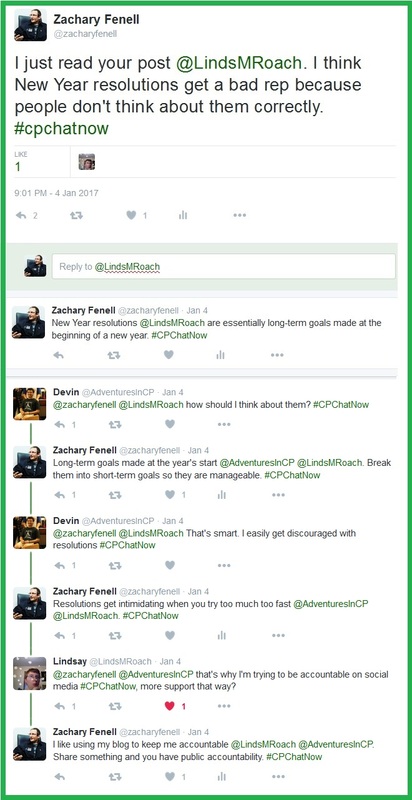 Overall our January 18th Twitter chat featured riveting dialogue. Looking ahead to tonight’s chat, riveting dialogue promises to become a trend. Last week I confirmed tonight our own Yasmin will lead us in a focus chat. Personally I am eager to learn tonight. You too?! Allow me to make suggestions to help you pass the time until 8pm ET. 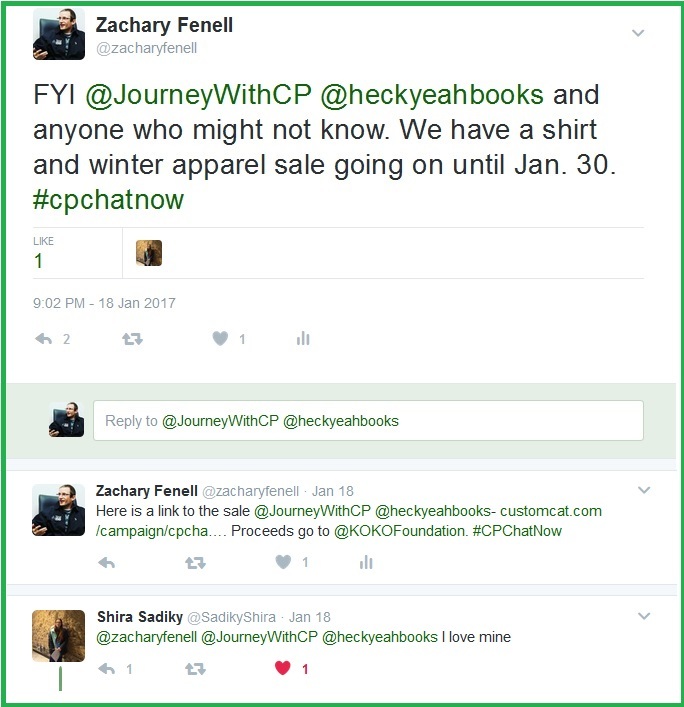 The #CPChatNow t-shirt and winter apparel sale ends in five days. 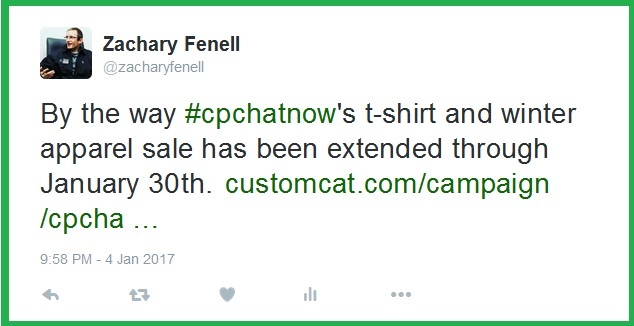 Explore the sale and order your #CPChatNow gear. Proceeds go to the nonprofit Keep On Keeping On Foundation. Prior to shopping though, remember to answer the extend-the-conversation question. Respond with a comment below. Finally, I wish to remind you tomorrow Thursday, January 26th we will hold our monthly Google Hangouts video chat. To inquire about receiving an invitation to the event please contact Devin Axtman or myself on Twitter by DM. Tweet you later! Meryl Streep’s Golden Globes speech and accessibility remained among popular topics discussed during #CPChatNow Wednesday, January 18th, 2017. I am co-host Zachary Fenell here with the highlights. Enjoy the following. Shortly after our usual Wednesday evening greetings, community regular Hamda Jamal turned our attention to Meryl Streep’s Golden Globes speech. Specifically she retweeted a reaction to Streep’s speech. Like the above screenshot shows reactions addressed the stereotype which views a person with a disability as helpless. A topic we talked about in the past both via our weekly Twitter chats and monthly Google Hangouts. 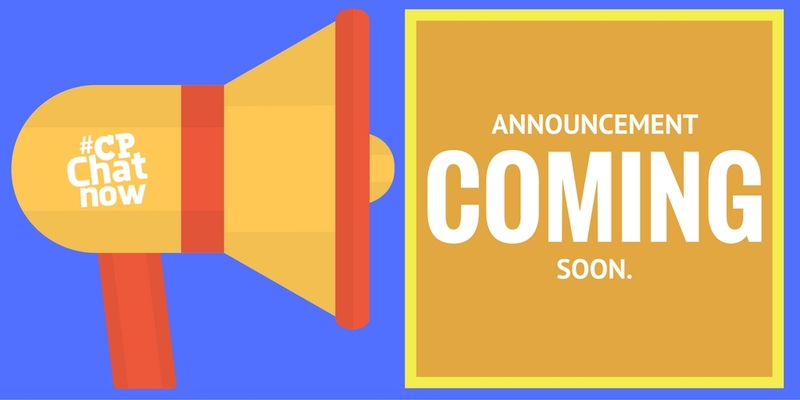 Regarding the latter, interim co-host Devin announced our January 2017 Google Hangout date. Meanwhile I sparked much dialogue by asking a question on accessibility. Blemi acknowledged many physical barriers to accessibility. Others who answered addressed accessibility more generally. Personally, the different responses intrigued me. See, the topic lingered within my mind since I began participating in another disability related Twitter chat, #AXSChat. Since I am still curious and I am the one writing today’s recap, I am making an executive decision. I declare “What does accessibility mean/look like to you?” the week’s extend-the-conversation question. Leave your reply in the “Comments” section. Please too share across the disability population. Let us compile responses from a diverse group! 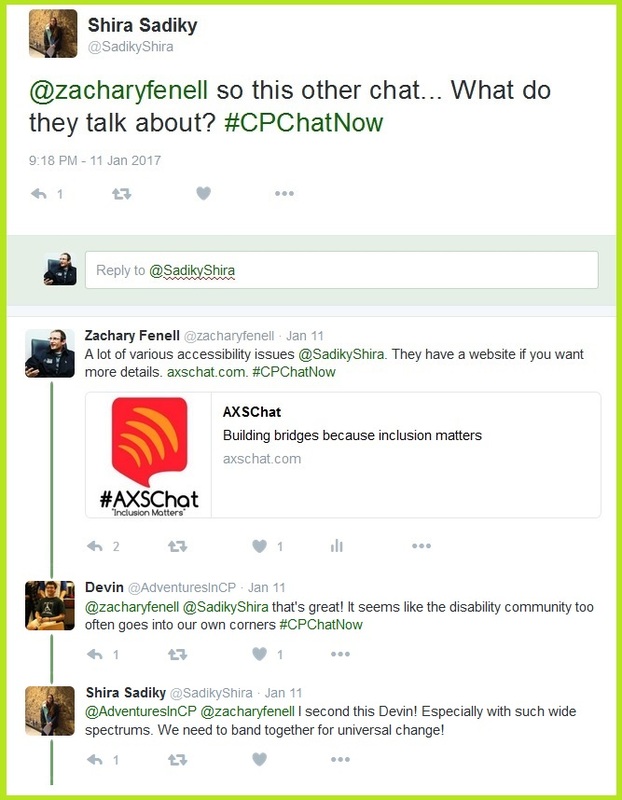 The value in reaching across different disability communities emerged while I told others more about #AXSChat. 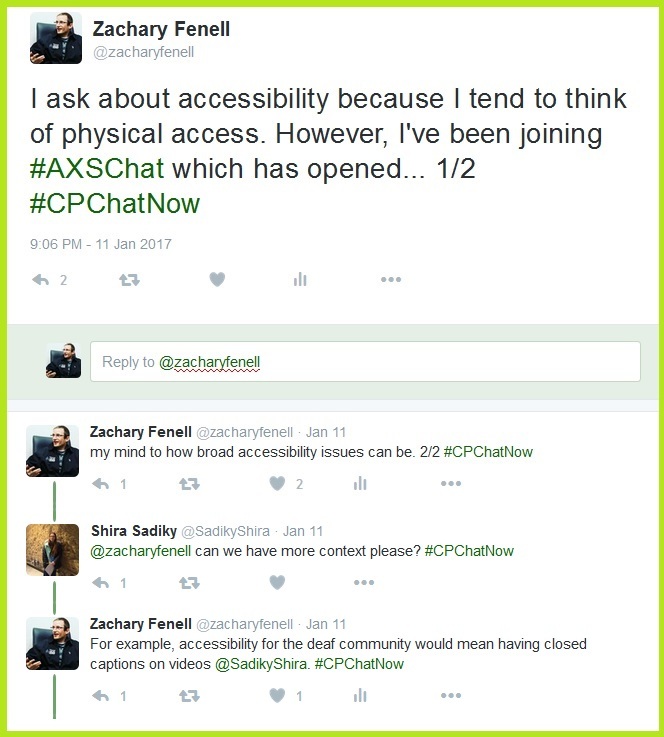 Like Shira, I also agreed with Devin‘s comments “the disability community too often goes into our own corners.” I encourage anyone from #CPChatNow to join #AXSChat (if your schedule allows). #AXSChat takes place Tuesdays at 3pm ET. For more information visit their website, axschat.com. In the meantime make sure you join #CPChatNow tonight at 8pm ET. We will confirm details for our January focus chat. 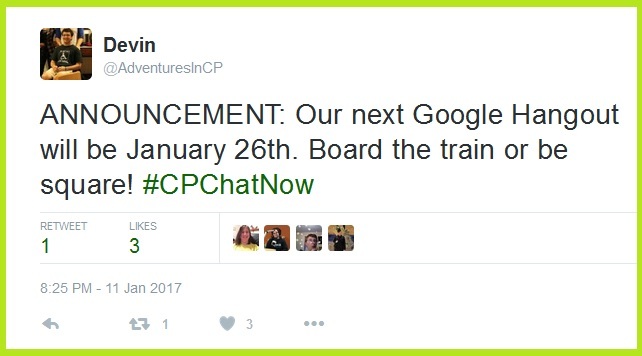 Additionally double check you marked your calendar for #CPChatNow’s January 2017 Google Hangout Thursday, January 26th. Contact Devin or I to inquire about receiving the invite. Finally, remember to answer the week’s extend-the-conversation question. Comment below to answer. Thank you for reading the weekly recap. Wednesday, January 4th, 2017! Yes, 2017! 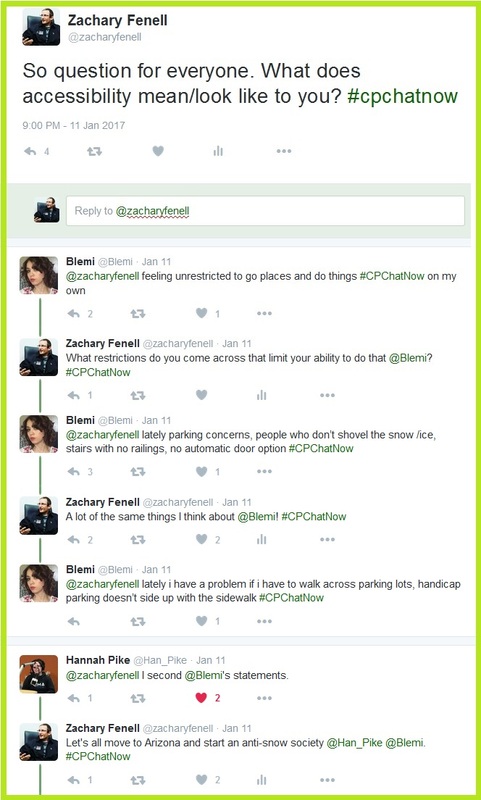 I am #CPChatNow co-host Zachary Fenell here with highlights from our first Twitter chat in the new year. Our live cerebral palsy Twitter chat happens every Wednesday, starting at 8pm ET. We began the New Year by addressing an issue which emerged to end 2016. 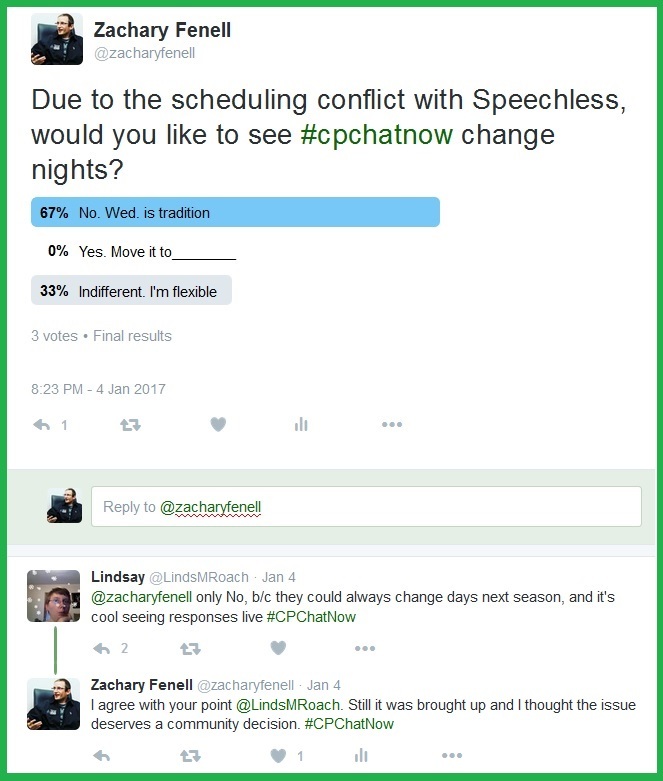 The poll sought feedback on a suggestion to move #CPChatNow from Wednesday to another night. ABC’s Speechless airing during the chat provided the catalyst for the proposition. Admittedly for whatever reason the poll only received three votes. Like I previously mentioned though, we also discussed the matter on Facebook and during our December Google Hangout. 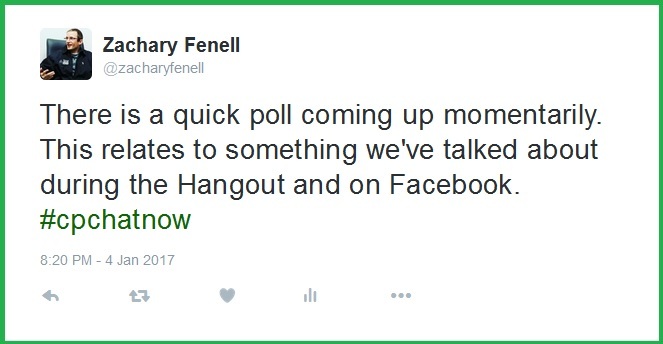 In our private Facebook group I posted a similar poll which experienced higher interaction. In that poll seven individuals voted. All but one recommending we keep the chat on Wednesdays. 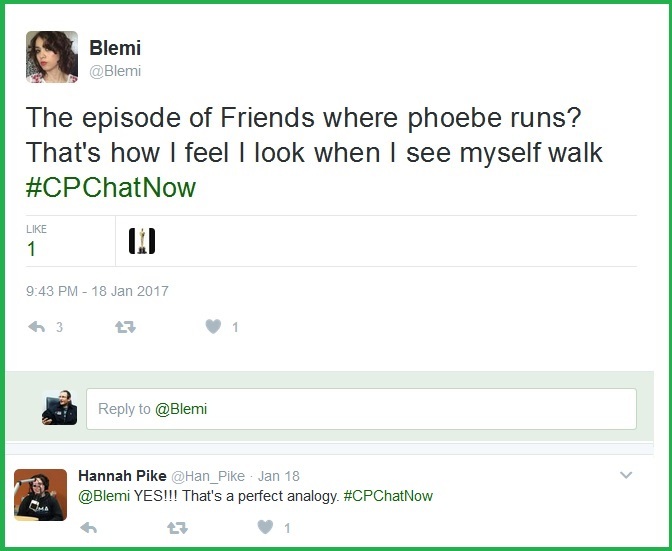 Therefore #CPChatNow will continue as a Wednesday evening tradition. Thank you to everyone who supplied their feedback to the potential scheduling change. Like I tweeted January 4th, I thought the suggestion deserved a community decision. After all, our communal environment enables us to thrive. If you ever possess a suggestion to improve our community, please voice your opinion. You can do so publicly or privately, whatever makes you comfortable. Publicly, our private Facebook group works well. Anyone not yet in the group should click the link above and submit a request to join. Privately, please send a Twitter DM to interim co-host Devin and/or myself. Your feedback influences our decisions. For example, I announced during the January 4th chat an extension for our t-shirt and winter apparel sale. Ensure you checkout our Customcat sales page before January 30th! You will find t-shirts, long sleeve shirts, hoodies, scarves, knit hats, and more available. Proceeds benefit the non-profit Keep On Keeping On Foundation. Now outside decision making dialogue, we enjoyed casual chatter. A question I asked regarding siblings sparked much discussion. For anyone interested in reading my blog post, indulge “An Older Brother’s Wisdom.” Since my question stirred such a reaction, I thought we should keep the conversation going. 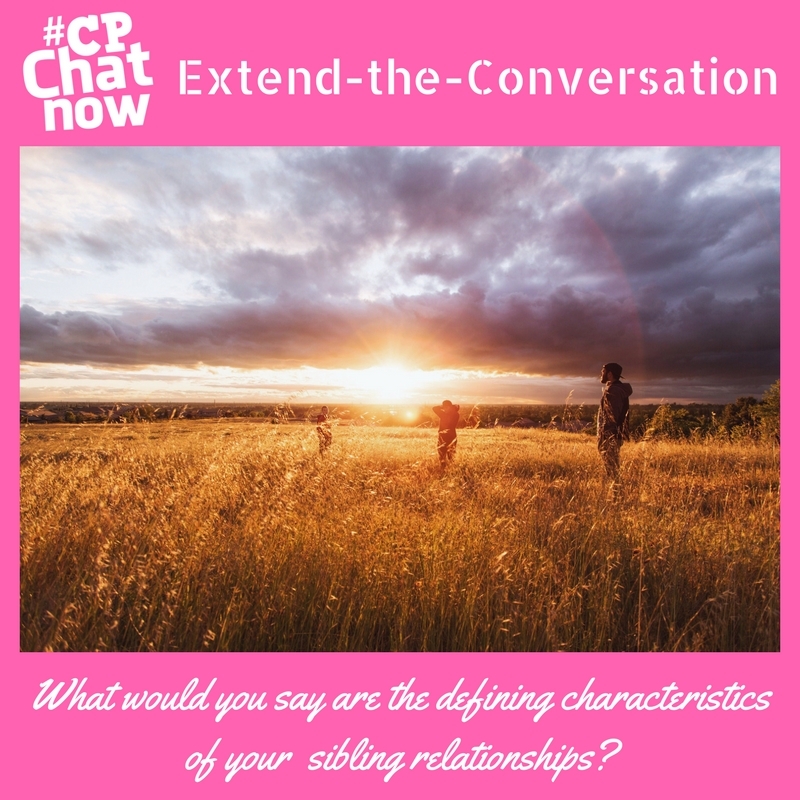 Answer for the week’s extend-the-conversation question “What would you say are the defining characteristics of your sibling relationships?” Respond by commenting in the “Comments” section. Remember to keep your New Year resolutions manageable. Think practical and executable. 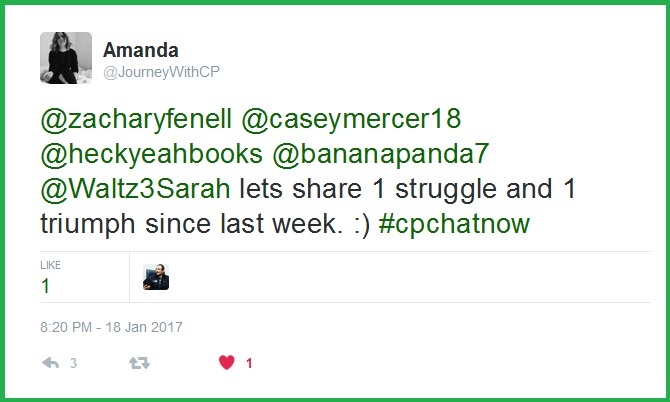 Perhaps you will resolve to “Stay better connected to the #CPChatNow community by answering the weekly extend-the-conversation question.” In case you adopt the aforementioned, get started right. Answer the following. Reply below. Until next time!